Assuming that there is some truth in the story that Fernando Alonso has already committed himself to driving for Renault next year, we can speculate on how his and other seats will be filled. There is the small matter of Alonso's McLaren contract to be sorted out but let us assume that this is dealt with somehow and the Spaniard released. Many are saying that Nico Rosberg would be the best choice for the drive but I think this unlikely. For a start, McLaren would have to pay a hefty sum to Williams to buy out his contract and I can't see Ron Dennis wanting to fork out a lot of money on top of the $100 million fine levied by the FIA this year. Yes, he may have a fair sum coming from the release of Alonso, but I think he would prefer to use this to offset some of the dent the fine will make in McLaren's finances, no matter how rich the company. The straight swap with Renault for Kovalainen looks even more unlikely, again for financial reasons but also because Ron has burned his fingers once on a Briatore driver and will be in no hurry to repeat the experience. It makes much more sense for McLaren to go with what they know for 2008 and put one of their test drivers in the second car. And that has to mean Gary Paffett; Pedro de la Rosa is nearing his sell-by date and cannot be flavor of the month with the team after his part in the WMSC proceedings. So I see Rosberg staying at Williams, probably teamed with Nakajima as a pay driver, depending on how well the Japanese rookie fares in his Brazilian debut next weekend. If he proves at all capable, Williams would surely give him a year's contract as a sop to their Toyota engine suppliers. Toyota themselves seem to have firmed up their team for next year, with Timo Glock almost certain to partner the stalwart Jarno Trulli. I know it's been said before, but surely the Japanese giant has to get it right sooner or later and it would be Ralf Schumacher's luck for that to happen in 2008, just too late to save his career. Which would be nice for Glock but leaves us still wondering where Ralf will end up. Personally, I think he will retire. Thoughts of other formulae, GP2, Champ Cars, or even NASCAR, are bound to be far from his mind; with Ralf it's F1 or nothing, I think. There is an outside chance of him winding up in the DTM, like so many other ex-F1 men, but I doubt even this. And the same goes for the other man likely to find himself without a drive next year, Giancarlo Fisichella. He will go off and get rich with his business interests in other areas. I see Heikki Kovalainen continuing with his Renault drive too; I can see no reason for Flavio to take a risk on Nelsinho Piquet when Heikki has already proved his worth. Piquet will not like it but he will just have to lump it, accepting another year as a test driver or going to a lesser team. The trouble is we're running out of seats. Red Bull and Toro Rosso have confirmed their drivers for 2008, as have Honda and BMW. That leaves Spyker, or whatever its name will be, and Super Aguri. Prodrive seem to be out of the picture unless a miracle happens. With Adrian Sutil staying at Spyker, the team would no doubt prefer an Indian driver in the second car and Piquet is unlikely to be able to provide the kind of money needed anyway. And Super Aguri will also want a paying driver if Davidson has to be dropped. Most likely it will be another year before we will see Piquet competing in F1. I have not mentioned Ferrari but then I hardly need to. The Massa to Toyota rumor was always very dubious and is now impossible with Glock getting the drive. Ferrari will keep their drivers and very likely Todt too. Stand by for the scramble that will result when teams realize that Ross Brawn is up for grabs. Honda? Maybe, but I still say watch McLaren - that's the move that makes most sense to me. So those are the changes I think likely for 2008. There's nothing wildly controversial in there, apart from the Ross Brawn thing, but when has a new season ever lived up to the wild speculation of the previous one? Considering the high tech world that is F1, teams are very conservative when it comes to drivers, most believing in the tried and tested and unwilling to make big gambles on reputations from other formulae. Of course, it does all depend on the Alonso rumor being correct. If Bild got that wrong, we could still be in for some interesting and unexpected combinations. I don't think De La Rosa can be blamed for his part in Alonso-gate. I think Ron knew about all this the whole time, hence why he was so pissed that Alonso threatened to blow the lid off they're dirty little secret. To deny him a seat would be making him the scapegoat. I think he would make a perfect #2 to the Ham. He has the experience to develop the car and set it up for races, and Santeria(?) is a Spanish sponsor throwing a lot of money to the team (because of Alonso's presence). Add in two Spanish GP's and it almost seems childish not to give him a chance. And I think the episode proves Ron knew nothing of what was going on. Otherwise, why would he immediately inform Mosley of what Alonso was saying? Ron didn't believe there could be such emails and thought Fernando was bluffing. De la Rosa is a part of the whole thing by his own admission. In fact, he was the point of contact with Coughlan through which any information was fed. Why would Ron reward such behavior with a race seat? Weather or not what he did was right, he did it to benefit the team, not to sabotage it. That was Alonso's doing. You don't think that the sponsors will play a part in this? If they had to choose between the two testers the Spanish sponsor would choose De La Rosa..... If it was they're choice (assuming they stuck around if Alonso was let go by McLaren). It is true that the sponsors may have a say in driver choice - but the Spanish will depart with Alonso, I think. And de la Rosa has far less influence in Spain anyway. So McLaren should have a pretty free hand in which driver they prefer. As to whether de la Rosa had the interests of the team at heart in using the info provided by Coughlan, it hardly matters. The point is that his emails caused a lot of trouble and expense for McLaren and they are unlikely to be all that pleased with him now. I don't think that McLaren will be able to employ Paffett because of the "two drivers of the same nationality" unwritten rule. It very rarely happens. Even though I'm sure they'd like to employ a sensible Martin Brundle controlled driver (Martin's Gary's manager I think). I think they will take Heikki. I agree with Alex. 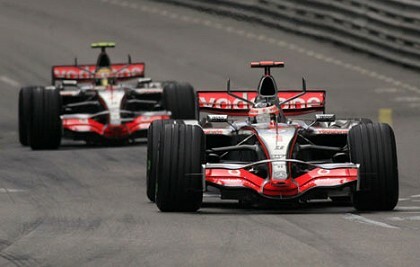 My feeling is that McLaren will take Kovalainen for 2008. I'm not sure what sort of financial or contractural difficulties there are that might prevent that, but he kind of strikes me as someone who would be a good McLaren driver, and if McLaren are interested in a suitable replacement for Alonso you can't do much better than Kovalainen right now. Also I would be surprised if Renault aquired Alonso without giving up a driver of their own as part of the deal. I fully expect Fisichella will be retiring at the end of this season, so that will mean Heiki goes, likely to be replaced by Nelson Piquet Jr.
Or perhaps Renault might offer up their option on Piquet Jr. to McLaren? same as several others here I expect someone from Renault going McLaren way in a direct swap (plus minus some money in either direction) for Alonso. It will be Heikki or Piquet. I don't think Piquet would be a risk for Briatore. Last time he raced he gave Hamilton run for his money in GP2 and, last time he raced he raced cars with no traction control ... He may have tough few races like Kovalainen early on, but I don't see him as a risk. I would not bet on having Indian driver in a race seat for sure nxt year. Mallya hasbeen quite vocal, that he will choose drivers based on skills, not nationality. It is likely he will pick Karthikeyan or Chandhok, but not exactly a sure thing yet. i m actualy realy happy with the performance of the force india . as they are newest in d buisness but they have a really displayed a realy class of performance. they have shown a better then super agguri . but there are some more technical improvement needed which will make them to compete with the best one . i would like to see this team drivers on podium. u can do it force india...( i always wantd 2 be dare with this team ) you hav good fortune buddies. I agree, Nikhil, Force India are doing well and likely to get better quite quickly. Mallya is determined to provide India with a competitive F1 team and will not stop until he achieves his goal. And that can only be good for the sport - it is almost impossible for new teams to enter now and so we must hope that those already in survive.